CARCHEX is the premier provider of Extended Auto Warranty and Mobile Vehicle Inspections. As the preferred partner to the most trusted names in the automotive industry, including Pat Goss of TV’s MotorWeek, Carfax and Kelley Blue Book, CARCHEX provides customized coverage plans allowing consumers whose factory warranties have expired to get the highest level of protection for their vehicles at the most competitive prices. A decade long commitment to protecting automotive consumers and providing exceptional customer service has translated into an A+ Rating with the Better Business Bureau. To learn more about CARCHEX and to Get Protected, visit CARCHEX.com. You have questions. Pat Goss has answers. 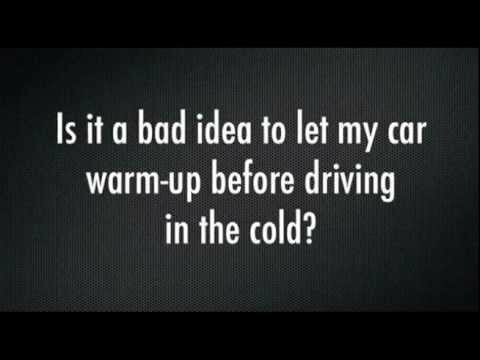 Is it a bad idea to let my car warm up before driving in the cold? Now you may ask, “Why is it a bad idea to let your car warm up for a long time before driving it?” Well, that’s pretty simple. When you let the car sit in idle the only thing you are warming up is the coolant in the engine. Not the engine oil, not the power steering, the brake system, the transmission, the differential, or any of these other systems on the car. That doesn’t mean, “Ok, I’ve got a warm engine! I’m going to go out and drive it like crazy!” It means you could be overstressing other parts and causing excessive wear. So, a minute to a minute and a half of warm up. Then drive it gently until everything reaches normal temperature. Genericcialisonline on Planning on Using a Hitch Cargo Carrier? Read This First!